It is a commonly held belief that arithmatic in the UK has declined following years of dumbing down, A-level grade inflation, and Play School being replaced by Tikkabilla. There was a great example of how random numbers have become in the Chipwrapper news feed yesterday. 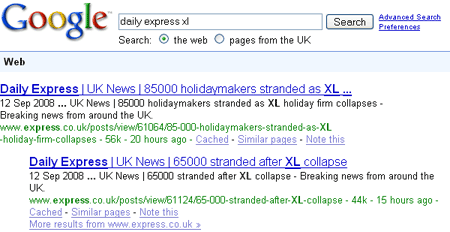 In fact, if you check with Google, you can see that the Daily Express were re-doing their sums all through the day. 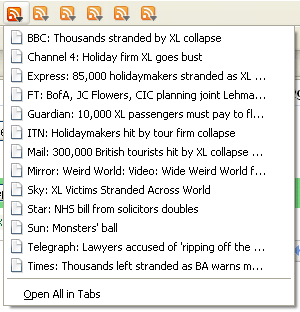 This is one of the drawbacks of using a CMS that pumps the URL full of headline keywords. If one of the vital headline ingredients is a number, and it changes, then you end up with two URLs for the same story - and a very visible Google record of how you've changed your mind. Actually, there was a bit of a lucky escape for me here. Last year, XL's flights between Chania and London were my regular commuter route, but fortunately none of my remaining carbon-blazing trail around Europe this year involved them. 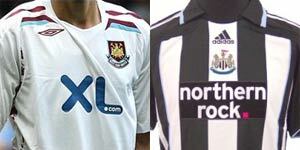 Not such a lucky escape for West Ham, who have lost their shirt sponsor. Perhaps the Government can step in to bail out XL, and then the taxpayer can be sponsoring two Premiership teams? By Martin Belam on 13 September 2008.